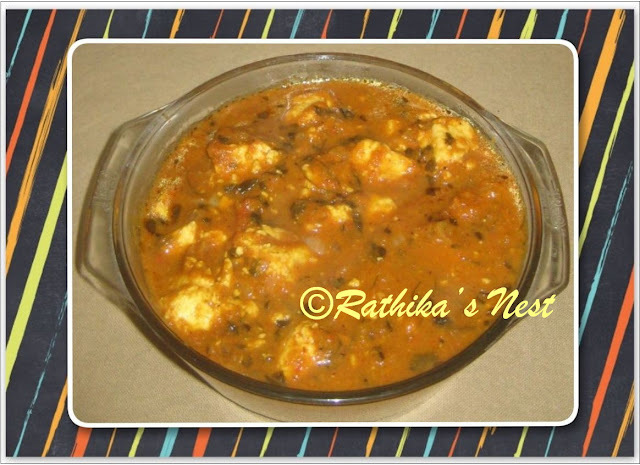 Paneer or cottage cheese is my favorite ingredient and I keep trying new paneer recipes every now and then. On the other hand, methi or fenugreek is an integral part of Indian cuisine and methi leaves are rich in vitamins, minerals and dietary fiber. This recipe combines paneer and methi in tangy gravy, and it tastes great with roti, chapatti or poori. Though fresh methi leaves are always preferable, you may still use dried methi leaves (Kasuri methi) instead. Here we go. 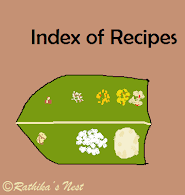 *Alternatively, you may use 1 bunch of fresh methi leaves. Wash the leaves in running water, drain fully and chop roughly. Method: Grind onion, tomatoes, ginger, garlic, coriander powder and Kashmiri chili powder in to a fine paste using the mixer-grinder. Keep aside. Heat oil in a kadai, add cumin seeds and when they start to sputter, add the chopped onion. Sauté till the pieces turn light brown. Now add the masala paste and kasuri methi; mix well. Cover and cook on low flame till oil separates. At this stage add ½ teacup or 100ml of water to the kadai and mix well. Add paneer cubes, required salt, jaggery powder and dry mango powder. Mix well and bring the contents to boil. Finally add kitchen king garam masala and simmer for 3-5 minutes. Your methi paneer is ready. Serve hot with chapatti and sliced onions.